Secondly, I would like to say that when I do brevets I ride them as hard as I can for as long as I can. I consider them training races for my events later in the year. While some may enjoy the slow to medium pace that is allowed with a 13 hour time limit, for a 200km anyway, I’m much more interested in beating my times from previous years. I’m out there to test myself and my fitness as I progress through the winter months. I don’t believe in loading up my bike for a 200km or even a 600km with bags, racks, panniers, or my person with camelbacks and all that stuff. I consider all that stuff completely unnecessary in an urban setting like San Diego. There are so many places to get water on the course i.e. park fountains, fire houses, stores, fast food places, garden hoses, and even homes. Additionally, the weather is very predictable in San Diego and carrying a lot of clothing for the “what if” situations is again unnecessary. I don’t wear rain gear in rainy conditions because most of it is subpar and doesn’t work anyway. The colder it gets the more ultra thin layers of wool I wear. I subscribe to the “less is more” philosophy when I “race”. I am a minimalist on the bike. If you leave it at home you will find you will rarely need it. I couldn’t believe how much clothing people had on at the start i.e jackets, vests, long tights, leg warmers, arm warmers, knee warmers, beenies and camelbacks. You would think they were doing a brevet on the east coast 😉 and that it was much longer than a 200km. I wore a short sleeve jersey and my Skins cycling tights which are for compression not warmth. I kept thinking about those riders who brought all that extra gear what they did with all that gear when it warmed up to 80 degrees. I asked the rider that parked next to me if he really needed all that gear. He said he did and I left it at that. 2004 Chart of the 200km Brevet the course is essentially the same in regards to the major climbs the controls have changed slightly and a re-route for safety in the Rainbow area. We started off with probably 65 riders. We rolled out from Doyle Park in La Jolla at 7:02am. There was one guy in a Death Valley Velo jersey pushing the pace from the very beginning. I couldn’t figure out WHAT he was doing going that hard at mile 0. I asked Drew Peterson if he knew who this guy was and whether he was strong enough to hold that type of pace for the whole event. I wanted to ask him myself but never got around to it. It didn’t matter anyway because he was dropped before we got out of Rancho Santa Fe (about mile 10). Pretty quickly our 60+ group was cut down to less than 20. By the time we got to Rancho Santa Fe we were down to about 10 riders. While riding through Rancho Santa Fe, I tried to organize a paceline and was unsuccessful. I can’t understand why Ultra cyclists are so dense on pacelining. In just about every Double Century I have done and many other draft-legal Ultras most riders get out and pull at the head of the line but don’t roll off. They sit out in front for many minutes at a time while the other riders are sucking wheel. We could be going so much faster– at least 2-3 mph faster. A four or five person paceline is a beautiful thing to watch. Here’s a tip– the paceline is in CONSTANT rotation. No one sits up front for more than 4-5 seconds that’s it. I gave up after a few attempts. While climbing through Del Dios Hwy we were less than six riders and the pace felt comfortable to me. I was having a good day on the bike and just felt great. Now the numbers were getting more manageable. My friend Josh caught up to us again. I was happy to see him bridge up to us. We tried a paceline again and this time it worked better. When we got to the intersection of San Elijo Road and Elfin Forest we quickly turned up San Elijo Rd. We didn’t see anyone manning a control at the intersection. We climbed to the top and didn’t see anyone one there either (not that they were supposed to be there 🙂 but just wishful thinking anyway. So we called the RBA and checked in with him. There were five of us at the top Drew, Dave, Mark, Josh and I can’t remember who else. We were about 35 miles into the event at it was exactly 9am. I don’t believe the base of the climb is a good place for the control. We continued to the AM/PM control at a decent pace nothing to stressful. When we arrived there was one rider on a very highly spec’d Colnago that “threw in the towel” and then there were five of us. Drew flatted on Old Castle Rd as we were beginning the climb. Josh fell off the pace and I don’t know what happened to Mark. Now it was just Dave and I climbing Old Castle. I felt great and kept the wattage near 280 (which is around 4 w/kg for me). I was in a good rhythm and could have pushed harder if necessary but I could tell I was dropping Dave. 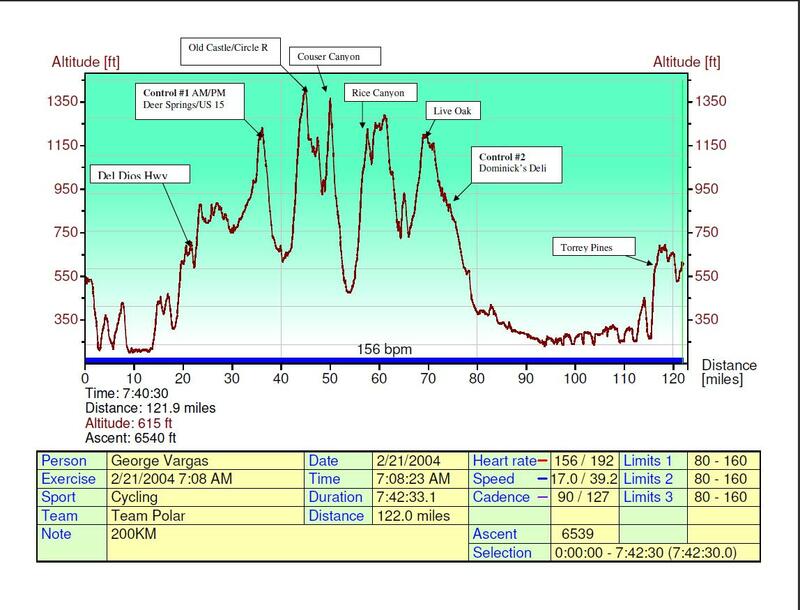 It was still too early to go solo being only about 40 miles into the event and another 80+ miles to go. Here are my numbers for the entire ride. 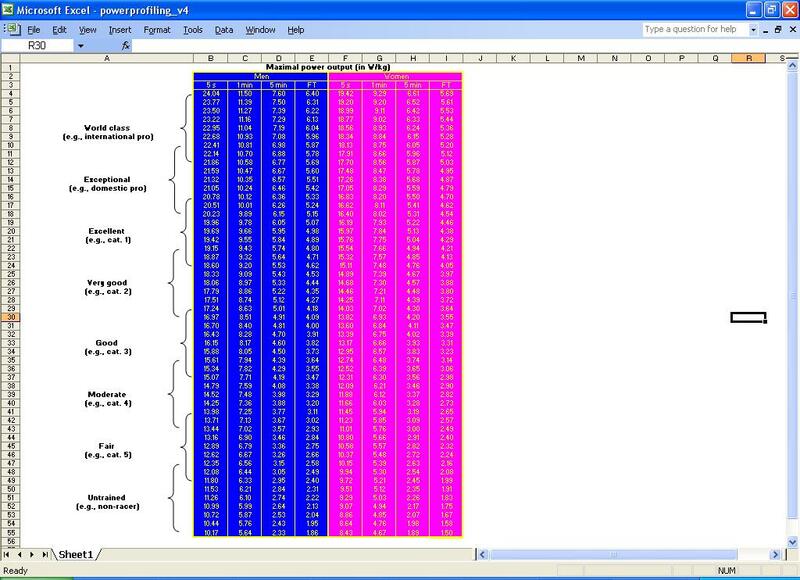 By the way for many of you this watts per kg talk may be over your head and I apologize for being such a numbers geek. I refer to power numbers, wattage and watts per kg, because it is a common denominator. People around country and the world reading this report would be able to understand my power output as it is more universally accepted as a measure of performance as opposed to my heart rate (which I don’t track anyway). Basically it is just a power to weight ratio. So the higher the number the better the ratio and the faster you will go …especially uphill. 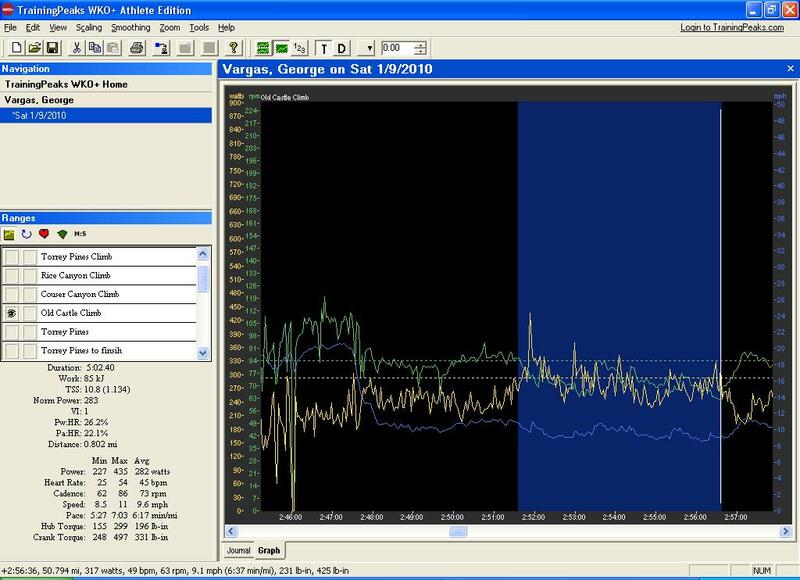 If I say I was climbing at 4.16 watts per kg or 4.16/kg. On Saturday 1/9 I weighed 150 lbs or 68 kgs. Now you look at the chart under the 5 minute column and find 4.16 and look to the left to see how that number corresponds with a general understanding of what type of power numbers riders that are Cat 3 can maintain for a 5 min period. As you can see the pros are on a completely different level than us when it comes to power production. Pros would be pushing in excess of 6.5 w/kg so for me that would be 68*6.5 = 442 an unfathomable number for 5 minutes!! Couser Canyon caught me by surprise this year. I had forgotten it’s steepness. Additionally, I was having Rear Der issues in that I couldn’t use my 27T cog. I was using an 11-27 cassette with my 53/39 chainrings. When I would place my Rear Der in the 27T cog it would hit the spokes on the wheel. It’s funny I manage a bike shop and can’t get my own bike worked on. But business is good and the mechanics have been really busy. Anyway, I climbed Couser Canyon in my 39/24 all the while wishing my 27 would be available. I found out on Monday, when my mechanic looked at my bike, that my der. hanger was bent and that is why the rear der was hitting the spokes. Dave and I descended Couser Canyon separately. I believe Dave is a cautious descender. A smart move because Couser Canyon has a lot of tight corners and the pavement isn’t that great. As we started the climb up Rice Canyon I said to him that it wouldn’t be long before Drew would catch us. And sure enough Drew caught us mid-way up Rice Canyon. We checked in to Rainbow about 11am. From Rainbow it’s pretty much all downhill to the finish. Sure you have a couple of little hills but basically it’s downhill and into the headwind as you head West. Drew and I did most of the work since Dave was having cramping issues. I was fine with letting him sit on since I have been in his shoes many times before and besides I was having a great day on the bike. On the San Luis Rey bike path Drew did most of the pulls and I rotated through sparingly. He had aerobars on his bike and I kind of wished I had mine on as well. 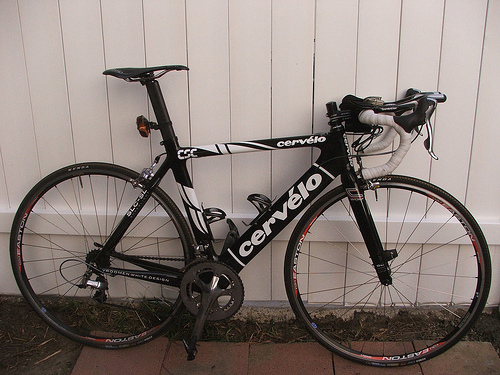 The bike I rode was the same bike I rode at the 2009 Furnace Creek 508 (Cervelo Soloist SL 16 lbs with pedals, Power Tap and everything needed except water bottles) and I had aerobars on it then. I have been riding with roadie groups in Orange County and so the aerobars have come off. I rode my Cervelo Soloist SL, Sasha, without aero bars. Once on Pacific Coast Hwy at about 1230pm, Drew again did most of the pulls. He was maintaining a good pace and I was having some cramping issues now. From the beginning of the day I had wanted to go sub 7 hours on this course because I had never done it. We were cutting it close but it was looking good. Sub seven hours would mean before 2pm. We were about 30 miles from the finish with less than 1.5 hours AND the most traffic laden section of the course still do. I find it amusing when riders on the coast draft US and then sprint up a roller and look back to see if they’ve dropped us. It’s funny because they don’t know we have been riding for close to 7 hours and have done 7000+ feet of gain. We pushed as hard as was necessary to maintain a sub seven our pace and let the rabbits go. I remember one time Drew was tempted to chase and I said “let him go” he agreed later calling him a “putz” I think. LOL! On the Torrey Pines climb I was getting tired and my power production was not really there. I was ok with just sitting on Drew’s wheel. His pace was good and honestly if I was up front we might have slowed down a bit. We were still able to pass everyone that was on the hill even though we were nearing the end of our 200km. I climbed Torrey Pines at 3.6 w/kg for a 7:15 total time. We arrived at 1357 or 1:57 pm. We rolled at 7:02 so our total time should be 6:55. I’m very happy with my time OUR time since I have never gone sub 7 hours on this course. Thanks to Drew and Dave, I achieved MY goal. By the way, it doesn’t come easy to do this course in sub seven hours. I was really tired, had had cramps and lots of leg fatigue, and a few aches and pains throughout the event. It’s just a question of how much suffering you want to subject yourself to in order to achieve your goals. By Monday my DOMS (Delayed Onset Muscle Sorenes) was in full force. I wore my Skins Compression tights for recovery over the next two days. I’ll only be doing the 300km brevet this year since I have schedule conflicts for the 400km and the 600km. Once again thank you to the RBA and all the volunteers. This entry was posted in race reports, San Diego Brevets by REV Cycling Directeur Sportif. Bookmark the permalink.